Students in Wilfrid Laurier University’s Social Determinants of Health and the Sociology of Medicine courses will have their creative course assignments on public display in the Teaching and Learning Commons March 19, 26 and April 3. The Waterloo campus displays are taking place thanks to a partnership between course instructors Kimberley Ellis-Hale and Laurie Jacklin, and writing consultants from Laurier’s Teaching and Learning department. The courses have Laurier undergraduate students writing opinion editorials (op-eds) for media outlets and creating academic research posters for their final course projects. Past projects have ended up in museum displays and in major newspapers. The spring events will follow the success of sociology and health sciences students in the Aging in Social Context and the Sociology of Health and Illness courses offered in the fall-term. The students presented their op-eds, infographics and research posters at December events, attracting more than 100 friends, family and community members. The creative op-ed and research poster assignments not only encourage critical thinking and help tie students’ personal passions with course concepts, they also offer students purposeful learning opportunities to engage with peers and the community. Students in Ellis-Hale’s Sociology of Health and Medicine class enjoy regular guest lectures to supplement textbook learning. Last term, Ellis-Hale brought in seven guest lecturers, who touched on subjects including safe injection sites, changes in provincial health education and female reproductive rights. Student Melanie McArdle was inspired by a visiting lecturer from Kitchener’s SHORE Centre, which provides sexual health information and support to community members. McArdle chose to make barriers to girls’ access to menstrual products the focus of her op-ed and infographic assignment. McArdle recently learned that her work would be featured as part of an exhibit at THEMUSEUM in Kitchener. 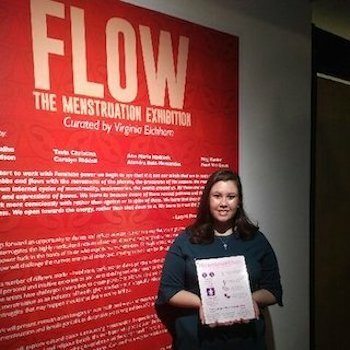 McArdle and classmate Navnit Bahugun were asked if their infographics and op-eds could be included in the resource section of an exhibit called FLOW | The Menstruation Exhibition. Running from March 6 until May 28, the exhibit is dedicated to discovering, discussing and destigmatizing menstruation. Classmate Eve Smerchinski’s op-ed advocating for the use of anatomically correct language in teaching children about body parts was published in a February edition of the Toronto Star. HE301: Social Determinants of Health (research posters), March 19 from 11:30 a.m. to 1 p.m.
HE301: Social Determinants of Health (research posters), March 26 from 11:30 a.m. to 1 p.m.
SY321: The Sociology of Medicine (op-ed display), April 3 from Noon to 1:30 p.m. The Teaching and Learning Commons is located on the second-floor of the Frank C. Peters Building at Laurier’s Waterloo campus. Read Laurier writing consultant James Southworth’s 2018 op-ed 'The value of the op-ed as a writing assignment' published in University Affairs.